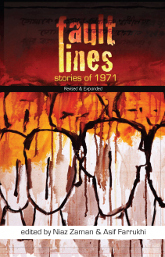 Fault Lines is the first anthology containing stories from Bangladesh, Pakistan, India, the United States and the United Kingdom on the theme of 1971. It obliges readers from the subcontinent to ask pertinent questions about their own history. What was a Pakistani soldier thinking when he was ordered to shoot unarmed women and children? How do women who fare worst in times of turmoil and tyranny cope when they become helpless victims of atrocities? Were all Bengalis brave? Were all army men evil? Discover quiet heroism in the painful tales from a turbulent time as the writers try to come to grips with 1971 and beyond. The anthology should be essential reading for those interested in that period as well as in riveting fiction. The insightful introduction by the co-editors draws upon their personal experiences in 1971, and suggests the context of these writings. Three more stories have been added in this revised and extended edition.